We think there’s something quite magical about December weddings. Whether it’s the cosy atmosphere and roaring open fires or the leafy green Christmas trees and twinkling fairy lights, a yuletide wedding will always conjure up images of celebration, family, love and laughter. 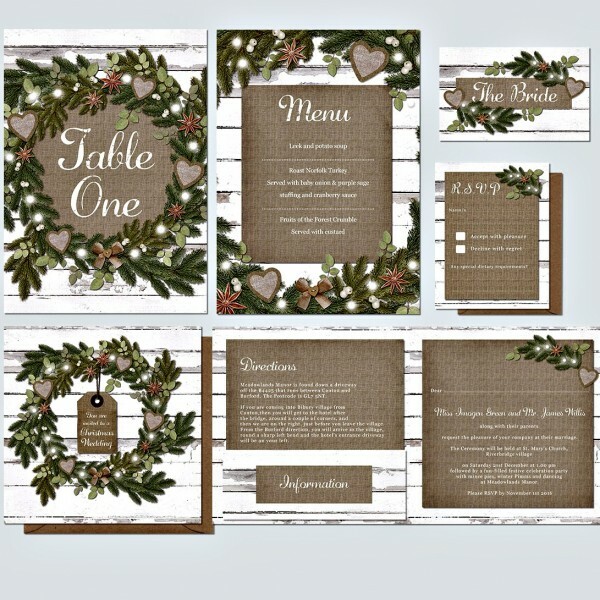 Inspired by natural Scandinavian style, the stunning Christmas collection from Lucy Ledger Ltd provides an elegant and simple design which will see your guests counting down the sleeps until your big day! Professionally printed on luxurious 300gsm matt textured board, the quality of this festive designer range will certainly not go unnoticed! Designed around a leafy rustic wreath with a shabby chic backdrop of painted and distressed wooden boards, this design is perfect if you’re looking to create a subtle Christmassy feel with a gorgeous neutral colour palette. The font used for this wedding invitation has a stylish worn look about it which works incredibly well with with the hessian-look backgrounds. The wreath is decorated with sparkly fairy lights, hessian love hearts and pretty bows adorned with little wooden heart buttons, plus fresh sprigs of mistletoe and star anise for a truly magical feel. With extra products available such as information cards, place names, seating plans and even guest signing boards, the extensive Christmas range makes it super easy to create a seamless wedding theme throughout your celebrations. What’s more, if you’re looking for an item of stationery that is missing from our list (for example ‘Will You Be My Bridesmaid’ cards), let us know and we’ll work our designing magic! If you’re feeling extra creative, why not plan a wreath making workshop with your bridesmaids to recreate the wreaths in this design? You can hang them up around your wedding venue for a real bespoke look that matches your wedding stationery!